Of course it's a subjective opinion, but Toshiba notebooks have always attracted me by their combination of technical solutions and original design. 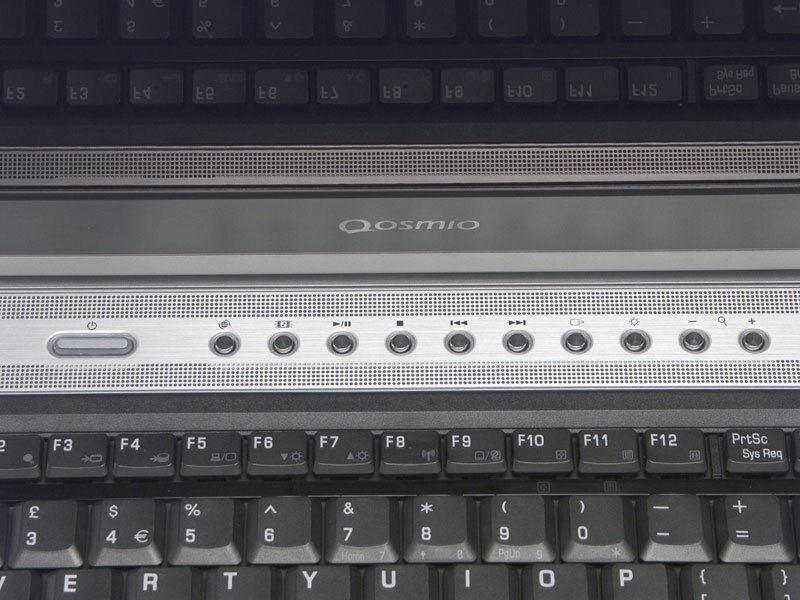 That's why the first impression produced by Toshiba Qosmio F10 was... disappointment. The design seems too inexpressive. However, the design impressions soon paled into insignificance. But let's not put the cart before the horse. 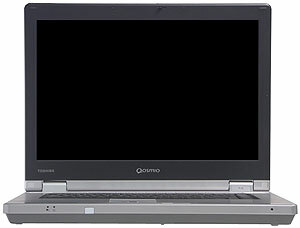 According to the Russian Toshiba web site, Qosmio combines audio, video, and PC into a single mobile digital multimedia system. Various video connectors back up these words. The notebook can input and output both analog and digital video. The set of audio jacks is standard. Theoretically, S/PDIF Out is sufficient, but the same input is not available. We tested a sample with minimum configuration. The bundle depends on a configuration and is published on Toshiba web site. As I have already written, the exterior of the notebook disappointed me a little, when I saw it for the first time. It's a standard "brick", silvery-topped and gray-bellied. It looks much worse than Satellite M30, to be frank. I repeat, this is my subjective impression. Perhaps, I fail to keep up with the present. Let's take an all-round view of the notebook. As you can see, the variety of video jacks must theoretically satisfy any exacting user. Monitor-in is intended for an analog video source connected via the bundled RCA adapter (Audio-Left, Audio-Right, Composite Video). 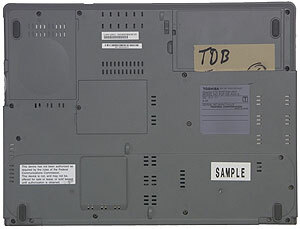 The front panel houses indicators for main power and notebook status, a dummy panel (some models are equipped with IrDA here), a display lid latch, and a mike. The mike is located in an original place, not quite optimal. The bottom houses a battery (top right on the photo), HDD (top left) and memory (center) bays. Let's open the lid. It should be noted that the notebook looks more attractive when you open it. Now we can talk about the strict design. The keyboard is rather convenient, but the layout of our sample differed from the traditional: «@» and «#» are obviously out of place. I like that the Ins and Del keys are to the right of Space. But I don't like the short Space. Unfortunately, it takes rather long to get used to this layout. Sticky Fn seems to me rather convenient, it saves you the trouble of holding it down for Fn+F1..F12 combinations. This feature is implemented in Toshiba Utilities. There are also some interesting hot key combinations - for example, Fn+Space changes screen resolution, Fn+4 switches to playback mode from the analog video-in. Detailed description of these combinations are published in the user's manual. Caps Lock indicator is right on the corresponding button. 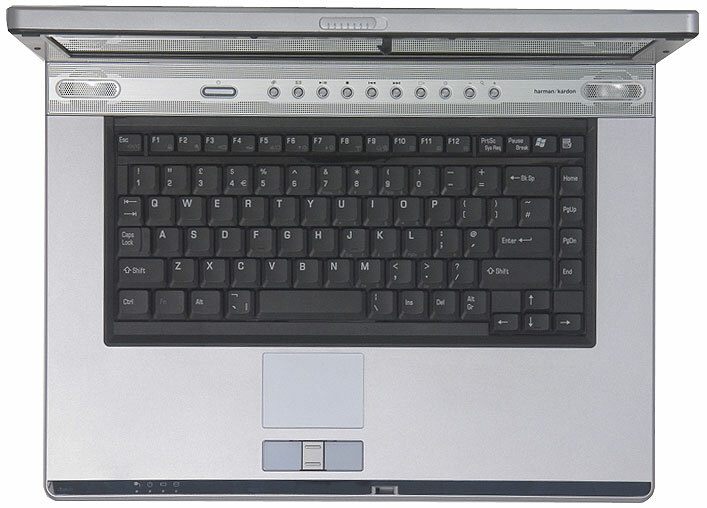 Scroll Lock and Num Lock are located on the insert that separates a row of functional keys. The touchpad is quite convenient, even my favorite scroll button is supplied. Built-in speakers produced an ambivalent impression. The sound is quite clear, but it noticeably lacks basses even compared to notebooks with subwoofers. That's why the sound in movies with lots of special effects is not expressive enough. 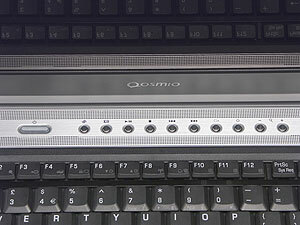 Qosmio Player plays back CD and DVD without booting into an operating system. It requires a 100 MB partition to be installed (readme recommends 200). Playback is controlled with a row of buttons over the keyboard. The player is configured by hot key combinations. You are strongly recommended to read the user's manual to get to know how to control the player. You can choose one of the three available image quality modes. Theater: intended for dark rooms, provides the theater presence effect. You can also choose one of the three sharpness levels: Low, Medium, or High. 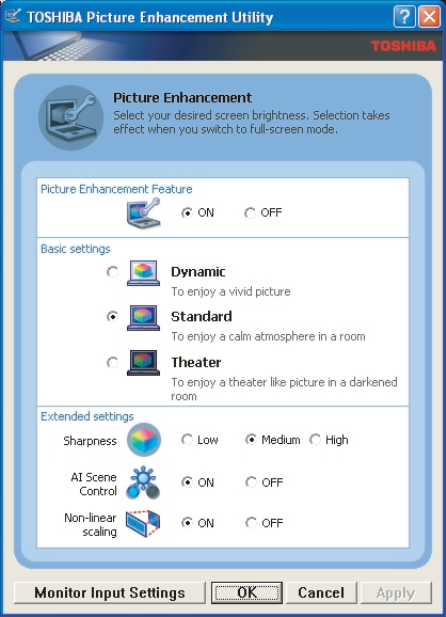 Here is a screenshot of TOSHIBA Picture Enhancement Utility. The matrix is probably the most striking part of this notebook. It leaves a wonderful impression. Subjectively, it's the best notebook panel I have ever seen. Bright saturated colors, wide viewing angles... The only drawback is glares, which you can see on the photo of additional buttons - the keyboard is reflected in the display. So you'd better watch movies, when the lights are subdued. You can look at the complete instrumental test results here, the main results are published in the table. The response time is average. High level of black spot luminance can be explained by the maximum brightness setting. It should be noted that the contrast is very good in this mode as well. Wide angles of view save the trouble of adjusting the panel position whenever you move. Rather high nonuniformity of black and white spot brightness is almost invisible by eye - you will notice that the bottom part of the panel is brighter only in very dark scenes. The notebook is backed up by 2 years of international warranty. Authorized service center - CEPCO. HD - Moscow, Soviet Army St, 5, Phones: (095) 684-5577, 684-5880, 684-5881, Web-site: http://www.cepco.ru. The list of service centers in other cities is published on the Russian Toshiba web site. The web site also offers E-Support. 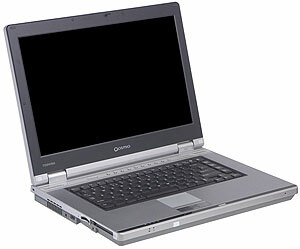 The notebook is equipped with a relatively rare video card - GeForce FX Go5700 128MB. Unfortunately, there can be no correct performance comparison to models with ATI graphics. The only model on the 8555 chipset with Dothan processor that passed our tests is ASUS M6Ne, but its ATI Mobility Radeon 9700 is equipped with 64MB. 128MB of video memory are installed in MaxSelect TravelBook X7+, but its CPU clock is just 1.7GHz. It can't be helped, we'll publish the results of these models for comparison (where justified), MaxSelect will be included just for a crowd. Battery run-down time for a 4 kg notebook is evidently not the most important mode. Nevertheless, the model survives more than two hours on its batteries. Now what concerns the main supply operation. Toshiba demonstrates minimum advantage, MaxSelect naturally lags behind. I'll publish a separate diagram with the results in wide screen modes. Now — 3DMark03. All test settings are by default. Here is a separate diagram for wide screen modes again. Unfortunately, the maximum resolution of the panel from Toshiba is lower. But it demonstrates excellent performance in supported modes and outperforms ASUS. And finally here go the tests in OpenGL games. The sound card is disabled. Here the Toshiba model is at advantage again. The higher the image quality, the higher the advantage. So, what do we get? Excellent panel, excellent performance for a notebook on the 1st generation Centrino platform, including 3D graphics. Plus DVD Super-Multi that can record double-layer discs. Design? Firstly, I have already written that the design gradually pales into insignificance. Secondly, tastes differ. of Toshiba in Moscow for the provided notebook.